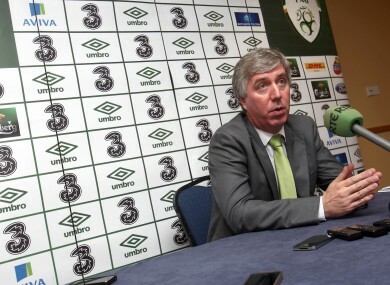 FAI chief executive John Delaney has been speaking about Martin O’Neill, Roy Keane and his hopes for the future. 1. When will Martin O’Neill be unveiled as the new Ireland manager? While there is still some paperwork to be signed, O’Neill’s first press conference is scheduled to take place in Dublin on Saturday. 2. How did Keane come on board? O’Neill met the FAI last week and put to them the possibility of hiring Keane as his number two. Delaney was adamant that O’Neill should be allowed pick his own coaching staff and said he had no problem with the choice. 3. Who else will be in his backroom staff? Bar Keane, we don’t yet know. Coaches Steve Waldron, Seamus McDonagh and Steve Guppy have all been mentioned as people who O’Neill would like to have as part of his backroom team but Delaney says it will be discussed when the pair meet over the weekend. 4. So who will take the coaching next week? O’Neill plans to have a hands-on role on the training ground when the team take to Malahide on Monday ahead of games with Latvia and Poland. 5. How are relations between Delaney and Keane? In Delaney’s own words: ”People won’t have known that Roy and I wouldn’t have had much contact in the past. We all say things at different parts of our life that we regret. We all say things at a point and time that are relevant. But anything that would have been said by Roy or I to each other or about each other is now irrelevant. Irish football and our country is bigger than anything. “I met him (Keane) last week. We discussed the past for about 30 seconds, I don’t want to give away too much about what was said because it’s unfair and I like to keep those things private. “I don’t think we had ever sat down and spoken before we met last week and it was absolutely brilliant from my point of view and I think from his point of view as well. 6. What did they talk about? “Then it was all about the future and how two great icons of Irish soccer in Martin O’Neill and Roy Keane can work together with people like myself and the association can work together for the better of Irish football and for the country. Delaney says it is time to “draw a line in the sand” over what happened before the 2002 World Cup. 8. Who played important roles in obtaining the two men? Delaney credits headhunters Ray Houghton and Ruud Dokter with doing “great work” over the past three or four weeks. Denis O’Brien is funding what will surely be large salaries of the management team while Celtic owner Dermot Desmond gave crucial support and advice, according to the FAI chief executive. Email “8 things we now know about Ireland's new management team ”. Feedback on “8 things we now know about Ireland's new management team ”.